The clear solution for quick, easy and translucent fastening. Press-on adhesive hook & loop fasteners for smooth surfaces. Hook and Loop Fastener Type: Adhesive Back; Size: N\A; Fastener Size(s): 5/8 Inch Diameter. 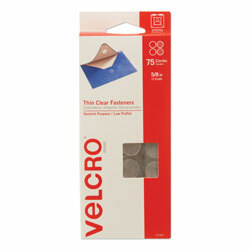 Clear Fasteners and Posts from Velcro! 537 In Stock today.